It’s been pretty quiet at winter NAMM as far as the major DAWs; Mackie released Tracktion 3 but the larger players either just released major updates (Cubase SX 4, DP 5, SONAR 6, Live 6, and the Pro Tools 7.x updates) or have yet to upgrade (ahem, Logic 8, anyone?). 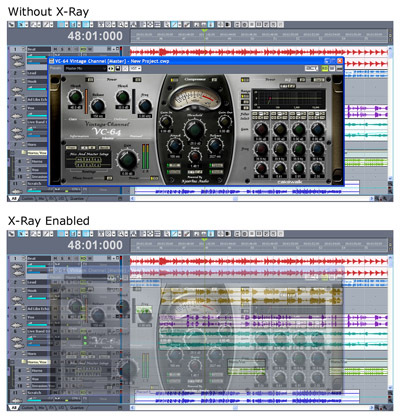 Do you really need to be able to see through plug-ins? Not sure; I’d rather use smart window sets. But will you want SONAR 6.2’s new Vista support? Absolutely you will. And now you have a reason to upgrade to Vista that’s a lot more compelling than just playing Halo and Flight Simulator X.
Vista support: SONAR is the first DAW that fully supports both the 32-bit and 64-bit Vista, but this is more than just basic compatibility. By supporting the new WaveRT driver and MMCSS (Multimedia Class Scheduler Service), SONAR should run more smoothly with more hardware at lower latencies. The full explanation of why is complex, so that will have to wait for another article. I hope (and fully expect) we will see other developers follow suit over the coming months as users migrate to Vista. As with x64 XP, the 64-bit edition gets extra CPU performance and greater RAM access (128 GB on Vista x64). MIDI input quantize: Input is quantized as it’s recorded, and you can set up per-track quantize settings. Updated: input quantize is non-destructive. Cakewalk reports that quantize undo is separate from record undo, so you can undo the quantization without losing the recorded data. That’s just how I like it. Field recorder support: Cue markers from .WAV recorders like the Edirol R-4 now show up on the time ruler — podcasters, interviewers, etc., rejoice. Smoother audio quantize: Previously, quantizing audio without time stretching could leave gaps — bad. (I noticed Craig Anderton mentioned this in his tutorial this month for EQ Magazine.) Now, AudioSnap fills and cross-fades the gaps — good. More Active Controller Technology Improvements: ACT, the feature that lets your control surface automatically map to SONAR, has been expanded to learn all plug-in windows, share and back-up mappings, match and jump (a bit like the take-over modes in Ableton’s mappings, though without the scale option), and support more controllers, among many other improvements. ACT is really setting a benchmark here for SONAR, and this seems to fix some of the major issues with the “point-oh” release. Overall, a big release for SONAR users. Most SONAR users I know use other Windows software, as well, so I will say I think this will be just the first of a number of Windows apps to take advantage of the new Vista features. Stay tuned here.